We start our Wednesday nights out by serving dinner at 5:45pm. Our volunteers enjoy preparing well-balanced meals that the kids enjoy...especially the dessert! Already ate? Coloring sheets are available for a weekly coloring contest with prizes! Pledge: As a Rainbow, I will be a good helper, pleasing Jesus every day. Colors: Green and white, which stand for growth and purity. letting my light shine for Jesus. Motto: Daisies tell about Jesus. Verse: Let your light... shine. Colors: Yellow and white, which stand for light and purity. Pledge: As a Prim, I will be careful of what I say, where I go, and what I do; trying always to be my very best for the Lord Jesus, because I love Him. Motto: I will be kind and thoughtful. Colors: Pink and white, which stand for kindness and purity. Pledge: Having accepted Jesus as my Savior, I will follow Him in service, in testimony, in attitude, and in relationships; striving always to glorify my Lord as a Star. Motto: I will follow Jesus. Colors: Blue and white, which stand for loyalty and purity. Girls in middle school or high school can go through a crazy time of identity shifting. They are starting to solidify their beliefs and values. Girls may confide less in parents and more in peers. Cultural values add pressure to a girl to indulge in choices that may have long-term consequences. "Friends" and "Girls Only" clubs strive to meet the needs that teen girls face head on. It is a Bible- and discussion-based curriculum for girls in middle school and high school that serves as a guide for the Titus 2 principle of godly mentoring for girls. The Ranger Kids will go for an adventure of learning. Their "trail" is a path of advancement through learning—from both experiences and activities—and being recognized for their learning. It is designed to offer every boy adventure and fun. It is every Ranger's opportunity to grow through new abilities, knowledge, and desires. 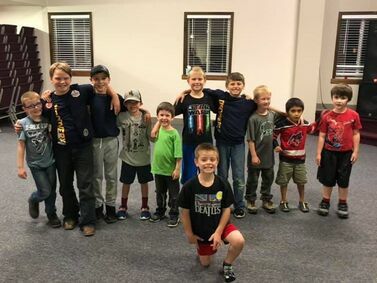 The individual steps that a Ranger Kid must take to earn his awards are directed to help him grow PHYSICALLY, SPIRITUALLY, MENTALLY, and SOCIALLY. Being a Discovery Ranger will give a boy many chances to do new things. He will learn new skills, like camping, building models, giving first aid, and cooking while learning about God and His Word. Royal Rangers will give him the chance to be rewarded for finishing merits and steps on the Advancement Trail. Along the "trail", each ranger has the opportunity to work on merits and earn badges, and as he collects badges, he can earn 3 different medals! Most of the merits will be earned during the weekly meetings, while others will require extra effort outside of meeting times. The merits can be earned in any order, but the values of following through and finishing projects are emphasised. Hard work should be rewarded and we are proud of our Rangers! offered in 1964 and the tradition continues to this day. There are several ways to earn the merits on this "Trail": some of the merits will be earned during the weekly meetings; others may require extra effort outside of meeting times. It's an exciting adventure all the way!